On the Mashujaa Day weekend, October 19-20, 2013, ZiAda will celebrate the far God has brought Kenya, and ultimately, the God of all time in the ZiAda Nakuru edition. ZiAda is a collaborative ministry channel comprising of award-winning Christian musicians Adawnage Band, Zidi The Band and Spoken Word poet, Number8. The group will mark its second year of taking the Word to the World through a series of revolutionary musical events intended to spread the love of Jesus Christ to the people of Kenya. In 2012, the team’s inaugural events took place in Mombasa, Nyeri and culminated in Nairobi, attracting audiences of over 3,000 people. 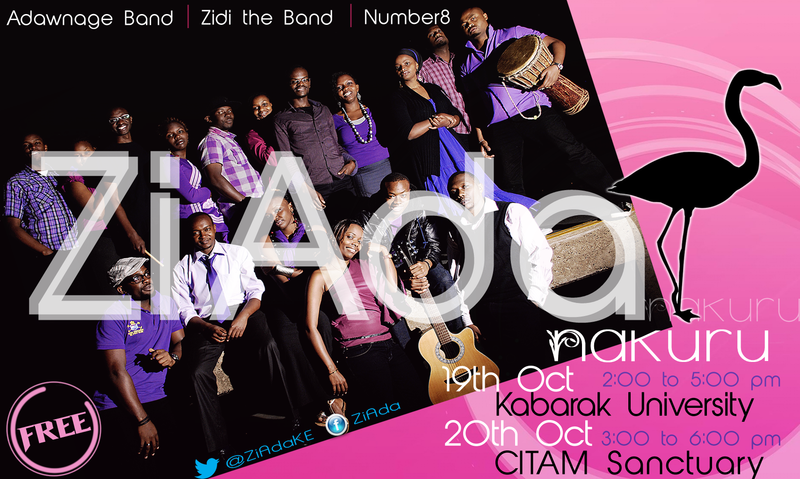 This time round, the ZiAda 2013 events will begin in the county of Nakuru with a campus edition at Kabarak University on October 19, followed by ZiAda Nakuru at the CITAM sanctuary on October 20 (See poster details). The planned Nakuru events will act as a precursor to the hugely anticipated climax to the year’s events – ZiAda Nairobi – set for December 14, 2013.